After the poppy, hook-laden excursions of My Little Pony, Strategy and Apendics Shuffle's Saw Saw Soup, Orac veers back again into left field, commencing a new series with this experimental split: four tracks for forward-reaching dance floors. 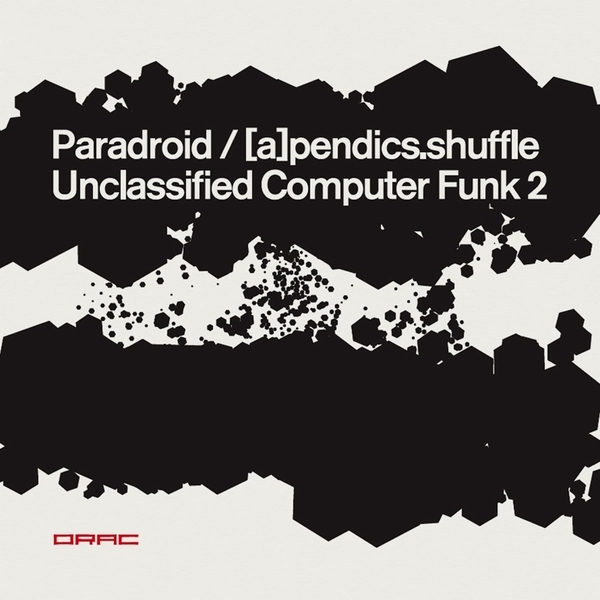 You could call them house, and you could call them techno- but the title really says it all : unclassified computer funk. Max wendling aka Paradroid lifts off the record, member of the Boogizm crew, rocking it just last week - Max represents fully here with two tracks of his signature machine funk. "Aircrash Bureau" is an action-packed and totally danceable gem, delivering in all departments: solid bass, acid sequences full of errors, synth stabs and tightly coded sounds at all compatible bit rates. Traversable nodes gets down with some proper sampling styles - starts out with a skeletal groove reminiscent of Doctor Rockit, then settling down to a comfy technoid bump anchored by a deep bassline. On the flip is a torrid [a]pendics.shuffle adventure. Struggling to arrest runaway percussion and control various oscillator leaks, Ken Gibson sings through his special, ye not unique "trout mask" when an argument of an entirely personal nature erupts with an unheard companion. "Your rim job" perhaps give us rather more information than we might have desired. "Torn feel" starts out with some network interference finding its way through to a drowsy beat, bubbling out in all directions. Precision funk constructed out of abstract noises creates some order in all this madness, picks up the pace, then passes the baton to a malfunctioning vocal sample which eventually gives up, but not without a struggle. Orac at it again - A Good Thing.